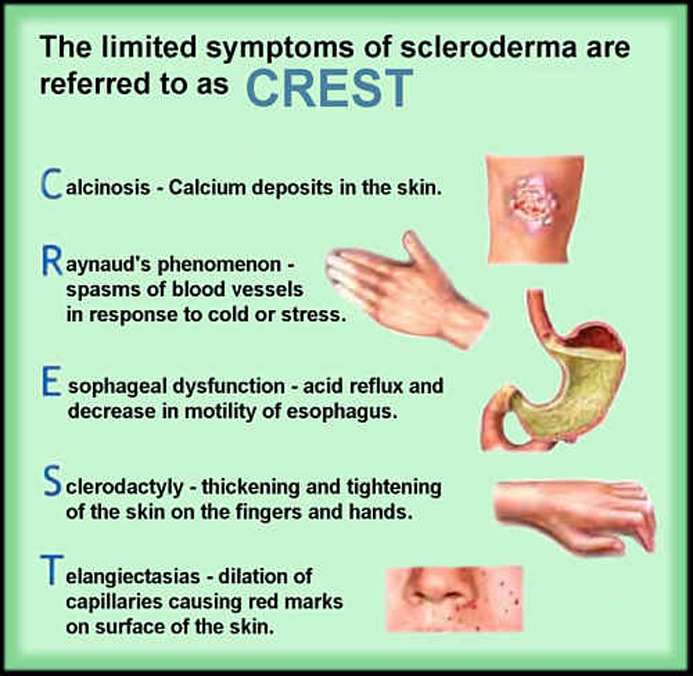 The word “scleroderma” means “hard skin” and is believed to be caused by an overproduction of collagen. 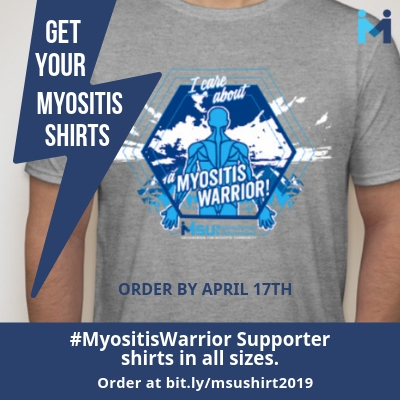 Like most forms of Myositis, it is considered a chronic, autoimmune disease primarily affecting the connective tissue, which is tissue that supports organs and other parts of the body. 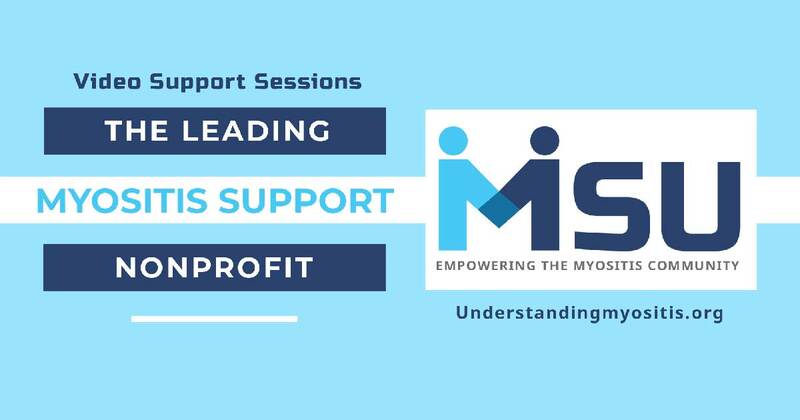 Approximately 300,000 people in the U.S. have Scleroderma as compared to an estimated 50,000 to 75,000 people with Myositis. 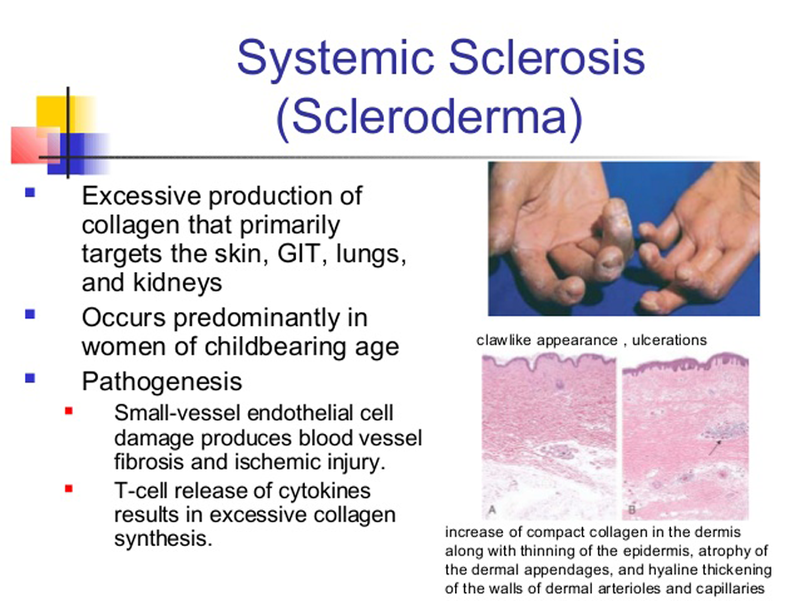 There are two primary categories of Scleroderma: Localized and Systemic. Typically affects the skin and/or muscles, but rarely anything else. 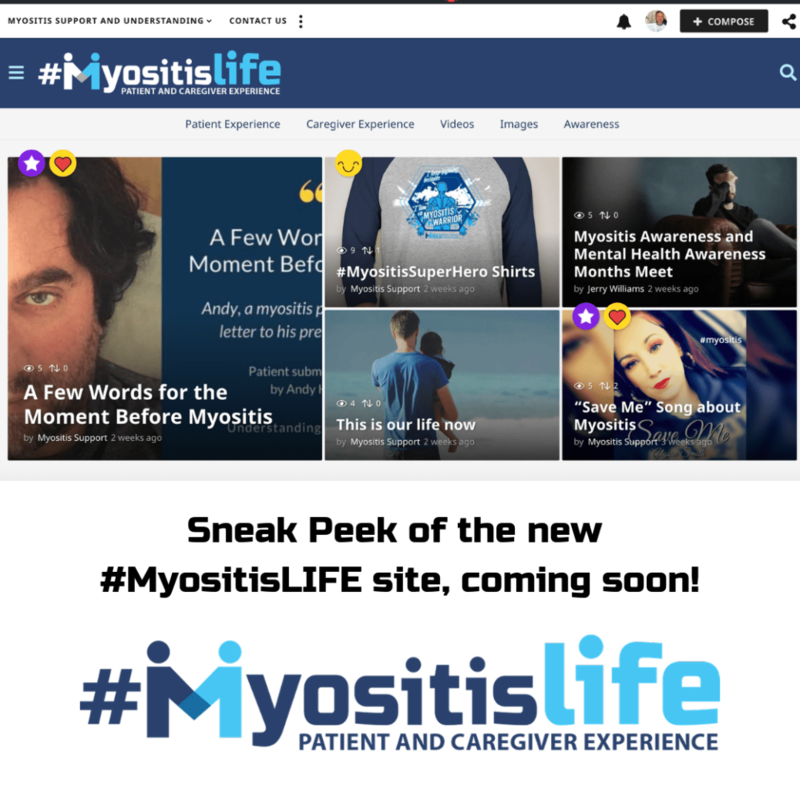 The two types most often seen within this category are Morphea and Linear. Morphea is characterized by waxy, and often thick patches on the skin, which can be any color, shape, or size. Linear is usually a waxy line or streak appearing on the arm, leg, or forehead and usually starts in childhood. The linear form can involve deeper layers of the skin, which can cause constriction of the joints, and approximately 10-20% of people with Linear Scleroderma will develop joint pain. 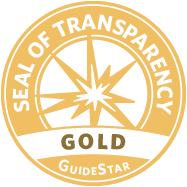 The term “systemic” means that the hardening is occurring internally in addition to the skin. Nearly everyone with Systemic Scleroderma, also referred to as Systemic Sclerosis, tests positive for the ANA (Anti-nuclear Antibodies). The two primary categories which fall under the systemic type are Diffuse and Limited. Hardening can occur in various parts of the body affecting blood vessels, kidneys, heart, lungs, digestive system, muscles, joints, and more. 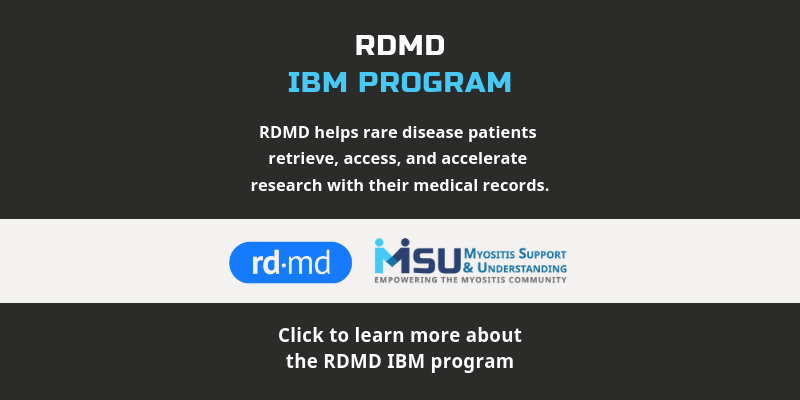 Diffuse Scleroderma is the more serious form of Scleroderma because internal organs are generally affected such as the gastrointestinal tract, heart, lungs, or kidneys. 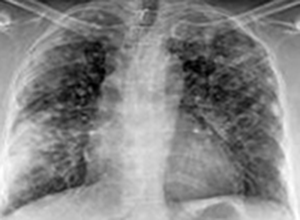 Of particular concern are Pulmonary Fibrosis and Pulmonary Hypertension. The degree of organ involvement varies significantly from patient-to-patient. Also in Diffuse Scleroderma, the skin of the arms, legs, and trunk are more likely to be involved. The tightened skin can make it difficult to bend fingers, hands, and other joints, while inflammation of the joints, tendons, and muscles can also occur. Tight skin on the face can reduce the size of a person’s mouth necessitating good dental care. Calcinosis is the formation of calcium deposits on soft tissue which can appear as small white lumps which form under the skin. The lumps may appear anywhere, but most commonly occur on the hands, (especially the fingers) or near joints such as elbows or knees. These lumps may break through the skin and leak white fluid. Calcinosis may range from a small lump to large clusters which can be very painful. 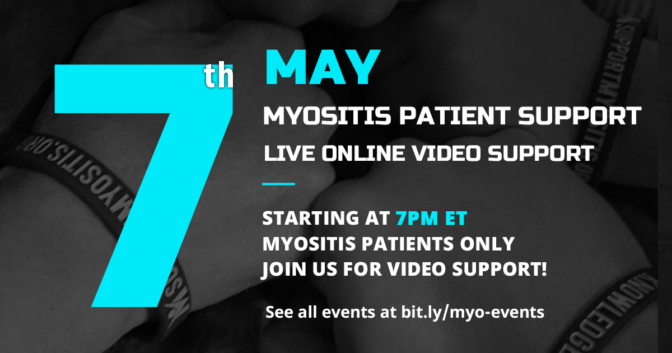 This is a symptom also seen in Dermatomyositis, especially Juvenile Dermatomyositis. Raynaud’s Phenomenon is a condition which causes some areas of the body, most often fingers and toes, to feel numb and cold in response to cold temperatures or stress. Small arteries that supply blood to the skin become narrow, which limits blood circulation to affected areas. The areas impacted can turn white, blue, and/or red. 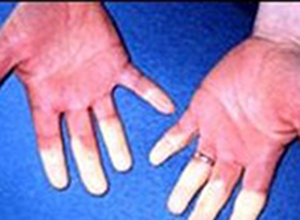 Raynaud’s is also commonly seen in people with Myositis. Esophageal Dysfunction is caused when the sphincter of the esophagus does not close as it should which results in backwash of stomach acid causing heartburn and possible damage to the lining of the esophagus. 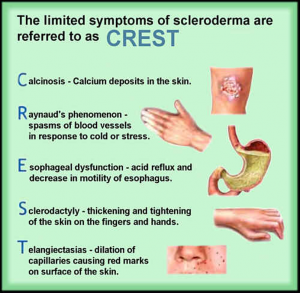 Sclerodactyly involves tightening of the skin and is the most classic symptom of Scleroderma. 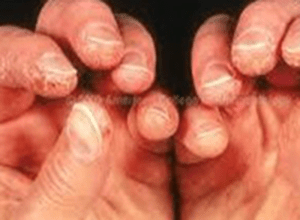 Typically the initial manifestation of this condition is swelling of the fingers, but as it progresses, the skin of the fingers and toes becomes hard and shiny. The fingers can become difficult to bend and can form contractures (shortening of the muscle or joint) due to severe tightening of the skin. Telangiectasias are small, dilated blood vessels close to the surface of the skin, which are usually considered harmless. 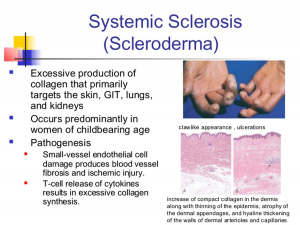 However, additional conditions have been found in Limited Scleroderma such as dilated capillary loops at the base of the fingernails, skin ulcerations, and skin hypo- and hyperpigmentation. While internal organs may be affected in Limited Scleroderma, they are less frequent than in the Diffuse form. 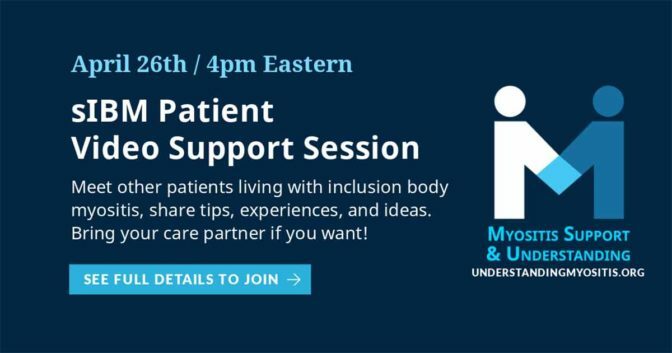 As with many autoimmune diseases, Scleroderma is a complicated condition that is often misdiagnosed because it can mimic other autoimmune diseases, and no accurate diagnostic test currently exists. 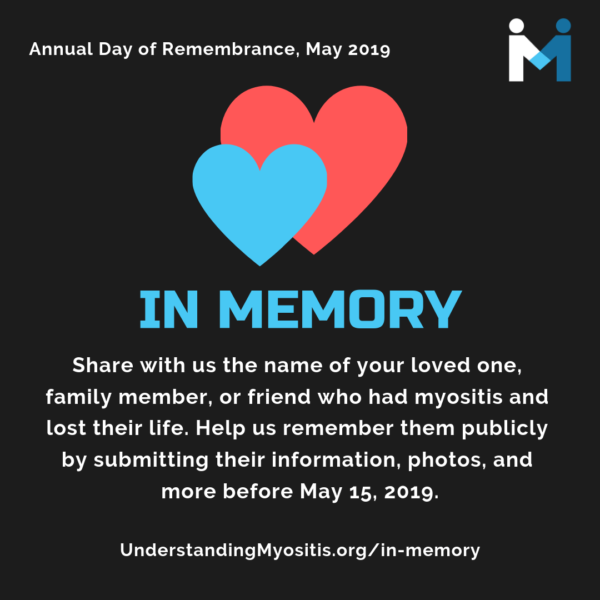 Symptoms vary from person-to-person and can range from mild to life- threatening depending upon which part of the body is most affected. Currently, there is no cure for Scleroderma. 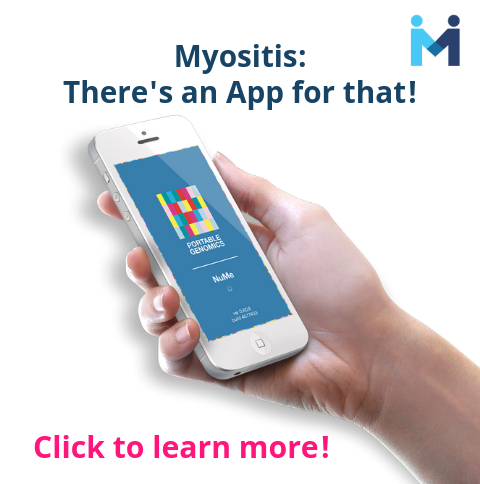 However, most of the individual symptoms can be controlled or minimized with medications. For instance, heartburn can be controlled by medications called proton pump inhibitors (PPIs). 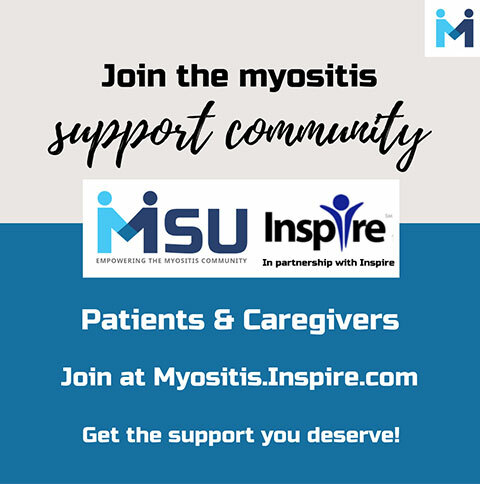 Sometimes, just as with Myositis, immunosuppressant drugs are used to suppress the immune system. 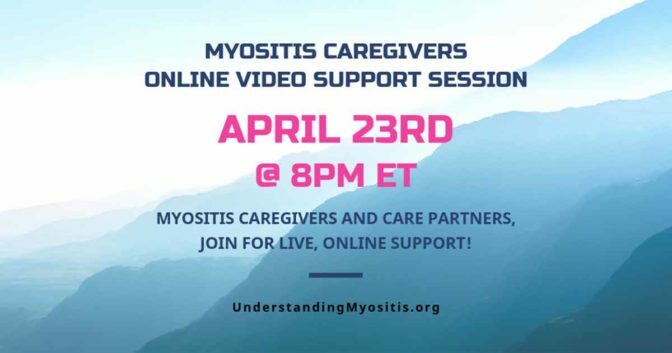 Some people with mild Scleroderma may not need medication at all, and occasionally people can go off treatment when their disease is no longer active. 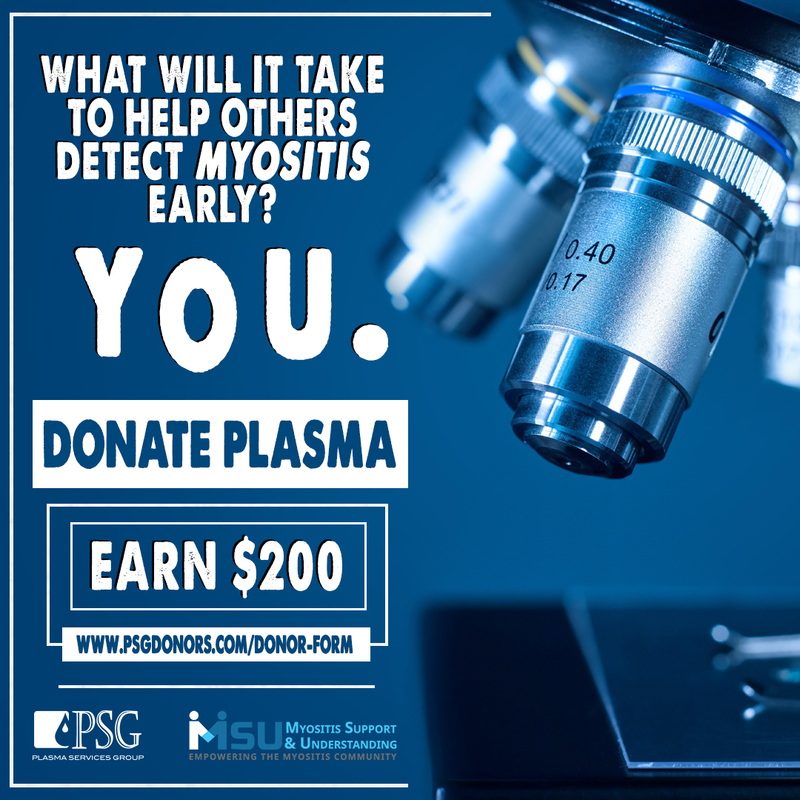 With a prompt diagnosis and treatment (usually by a rheumatologist, dermatologist, or another physician trained in skin, systemic, and autoimmune diseases) it is possible to reduce the seriousness of the disease and help to prevent irreversible damage.